This course surveys various issues pertaining to family law, including the marital relationship, divorce, alimony and other forms of support that can result from divorces, equitable distribution of property, and child custody. We will also focus on recent decisions and legislation that have had profound impact on relatively modern issues and trends, such as legitimacy and status, "palimony," the rights of unmarried parents, "surrogate" parents, and no-fault divorce. Analyze a pre-nuptial agreement with standard clauses. Describe the basis upon which pre-nuptial agreements can be challenged. Describe the requirements for marriage in most states. Determine whether a valid marriage exists in a particular hypothetical scenario. Describe the rules of the commencement and dissolution of parental rights. Describe and apply the rules of custody of biological children, adoption and the termination of parental rights. Apply the all important "best interest of the child" standard. Describe the prevalent grounds for divorce under the law of most jurisdictions, both in terms of "fault" and "no-fault" grounds. 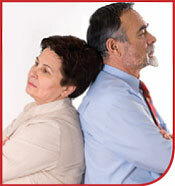 Apply the rules of martial property upon divorce and the rules regarding child support.